The Starkville Area Habitat for Humanity is a Christian mission that seeks to put God’s love into action by building homes, communities and hope. The Starkville Area Habitat for Humanity is dedicated to eliminating substandard housing through the construction of new homes and providing an affordable mortgage to low income homeowners who need a better place to live and are willing to work hard to make a better life for their families. Habitat for Humanity was founded on the conviction that every man, woman and child should have a simple, durable place to live in dignity and safety, and that decent shelter in decent communities should be a matter of conscience and action for all. 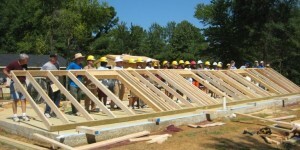 The Starkville Area Habitat for Humanity has an open-door policy: All who believe that everyone needs a decent, affordable place to live are welcome to help with the work, regardless of race, religion, age, gender, political views or any of the other distinctions that too often divide people. In short, Habitat welcomes volunteers and supporters from all backgrounds and also serves people in need of decent housing regardless of race or religion. As a matter of policy, Habitat for Humanity International and its affiliated organizations do not proselytize. This means that Habitat will not offer assistance on the expressed or implied condition that people must either adhere to or convert to a particular faith, or listen and respond to messaging designed to induce conversion to a particular faith. The Starkville Area Habitat for Humanity accepts applicants from potential homeowners two times a year. In 2018, applications will be accepted during the months of March and September. Applications will then be reviewed by the Family Selection Committee and credit and background checks will be conducted. Individual interviews and home visits will then be scheduled for applicants who were not eliminated in the first round of application review and credit and background check. The Starkville Area Habitat for Humanity is only able to build houses for a small number of applicants. Our selection process is long and thorough. Unfortunately, many needy, qualified applicants are turned away each year. It is the goal of our Family Selection Committee to choose the most qualified candidate based on need, the ability to successfully complete a 20 year mortgage. How do I qualify for a Habitat House? In order to qualify for a Habitat House three conditions must be met. You must need a better place to live. All Habitat homeowners must be currently living in substandard housing. This includes leaky roofs, poor plumbing or electrical systems and overcrowding. You must be able to make payments. You must partner with Habitat for Humanity. a.) You must agree to perform 300 hours of “sweat equity” by volunteering on the worksite, at the office, feeding volunteers or other approved activities. b.) You must agree to attend three classes, one of which must be a financial literacy course.